In the previous four years, we have made clothes for the orphans looked after by Vision, a local man who runs an informal, but vital, feeding scheme for vulnerable children. This year, instead of using Mumbo’s old fabric to make the clothes we opted to buy a bale of children’s clothes for them from the charity which imports them. These clothes are more robust and longer lasting and we were worried that the chitenje clothes we provided previously perhaps set the children apart too much. 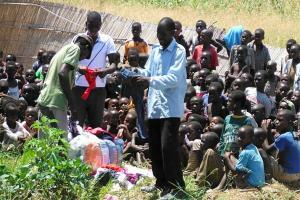 About 300 orphans benefitted from the distribution of the clothes and were absolutely thrilled with their new outfits. These orphaned children live with family members who struggle to feed and clothe the extra mouths, and this is why we have chosen to help Vision’s project by giving the clothes and making a substantial monthly contribution to his food costs.